Although David Olney's songs have been recorded by some great singers, he's a fine performer in his own right. 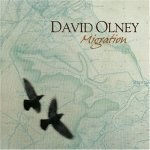 Despite making records since 1977, David Olney holds the distinction of having his work better known through other artists' interpretations. Such luminaries as Johnny Cash ("Jerusalem Tonight"), Emmylou Harris ("Deeper Well"), Steve Earle ("Saturday Night and Sunday Morning"), and Del McCoury ("Queen Anne's Lace") have successfully covered his tunes. While it's great that such fine performers have recognized Olney's talents, it's a shame that Olney's abilities as a performer haven't been recognized because he has an interesting and expressive vocal style. He does a good job of putting across his own songs and those of others, as evidenced by his latest release, Migration. Olney wrote or co-wrote nine of the 11 tracks on the album, which vary from quiet folk songs to bluesy hard rockers. He effectively uses his low voice (think Leonard Cohen) to convey a serious tone when needed, but he's not afraid to growl or hit the high notes when the tune demands it. As Olney explains on the appropriately entitled "The Song", he puts his performing talents in service to the tune rather than the other way around. He does this even on the two non-original cuts by relatively obscure songwriters, Steve Runkle and Rebecca Hall. Olney assumes a different persona for each song. He may write about personal feelings, but cloaks the autobiographical or confessional aspects of his material in the guise of a character (and not always a human one). The most touching track on his new album, "Lenora" is told from the perspective of a bird. Olney does not specify what species of bird, but through the details of the narrative we learn it is one that is migratory and mates for life. When human hunters shoot Lenora, Olney's keeps the language muted, which has the effect of making the sorrow seem deeper. (Think of Emily Dickinson's great line, "After great pain, a formal feeling comes.") This literary reference is apt as the song's title and theme of mourning for a lost love seem to refer to Edgar Allen Poe's poem about a bird, "The Raven". On the clever "My Lovely Assistant", Olney tells of a magician driven mad by his affection for his helper. Olney artfully builds the suspense. At first the narrator calls love the greatest magic of all and talks about his assistant's charms. Then he mentions how she cut up his heart in little pieces and threw his love away. At the end of the song, he's revving up the chain saw and declaring that love, like magic, is just an illusion as he goes to cut her in half. The song appropriately ends with the listener unsure whether the magician performing a trick or committing a heinous murder. While these songs reveal Olney's talents with language, he's not afraid to whoop it up and make a lot of noise, letting the music do the talking. Olney usually plays acoustic guitar, but here he uses an electric guitar on several cuts. His band includes Deanie Richardson on fiddle and Mike Fleming on bass, but Olney does not employ a drummer. (giving the music a strong rhythm without a beat). Olney and Company make a big racket both on "Ace of Spades Blues" and the rollicking "Upside Down". The latter shows a gospel influence in style and in lyrical concerns. Olney doesn't shy away from using Christian references on this song (and some others), but he's not a Christian rocker in the conventional sense of the term. His faith is more radical and questioning of traditional values. He shies away from Sunday School pieties and believes that if Jesus were here he would "want to turn the world upside down and see what's worth keeping", a sentiment even a nonbeliever like me can endorse in spirit.